We analyzed Donald Trump’s speech at the Republican Convention on Thursday, July 21, 2016 and Hillary Clinton’s speech at the Democratic Convention on Thursday, July 28, 2016. Trump’s speech totaled 4,382 words and Clinton’s speech totaled 5,191 words. Each speech was weighted so it would have the same number of words: 5,000. The first, a proprietary linguistics analysis, is a standard analysis conducted at Beall Research and is typically used to understand consumers’ perceptions and sentiments towards brands, products, and services. The second type of analysis is customized for each project. This analysis measures a range of topics, including: brand/product attributes, source of awareness, usage frequency or occasion, purchase channel, satisfaction, brand evangelization, purchase barriers, etc. In the analysis, rows present each candidate’s share of a particular category, which adds up to 100%. In other words, each item occurred a certain percentage of the time in Trump’s speech and in Clinton’s speech. A Chi Square score is calculated for each distribution, measuring how much a particular distribution varies from what we would expect to occur by chance. We would normally expect that each item would occur equally in both speeches. If the item occurred more than would be expected by chance, the chi-square statistic will be statistically significant with a P-value below .05. 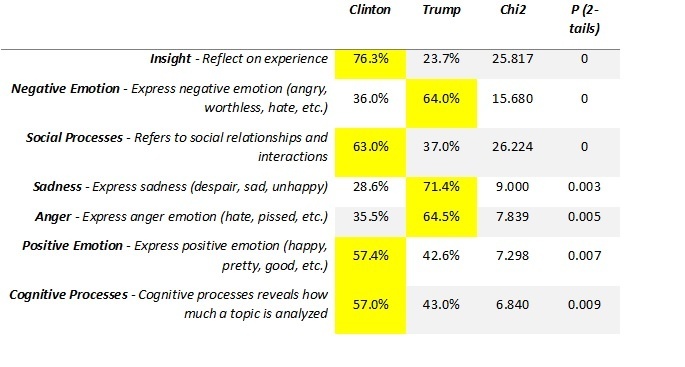 In this linguistics analysis, we found that Trump’s speech had more negative emotions such as anger (i.e., “fight,” “hatred,” “threaten,” “destruction”) and sadness (i.e., “suffering,” “helpless,” “regrets”) than did Clinton’s speech. Across both speeches, nearly two-in-three expressions of negative emotion are from Trump. 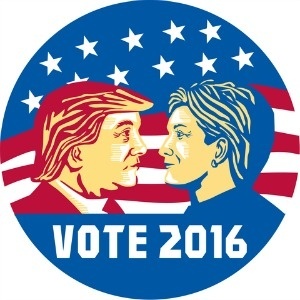 We also conducted an analysis of the specific issues that both candidates discussed. In this analysis, we found that Clinton’s speech discussed salient issues such as “health,” references to “women/daughters/mothers,” and ideals and values (i.e., using words such as “build,” “strong,” “belong,” “opportunity”). Trump’s speech covered matters that are neutral to negative in sentiment, and words such as “oppose/opposition,” “borders,” and "violence/war/murder/attack" are found at significantly higher rates. He also mentions “lying,” “laws,” and “deals” more than Clinton. Trump’s speech also contained more polarizing public policy references (“terrorism,” “refugees,” “trade”) or failings and defects (“untruthfulness,” “destruction”). Linguistics analysis supports voter perceptions that Trump’s speech contained significantly more negative content and emotion than Clinton’s speech. 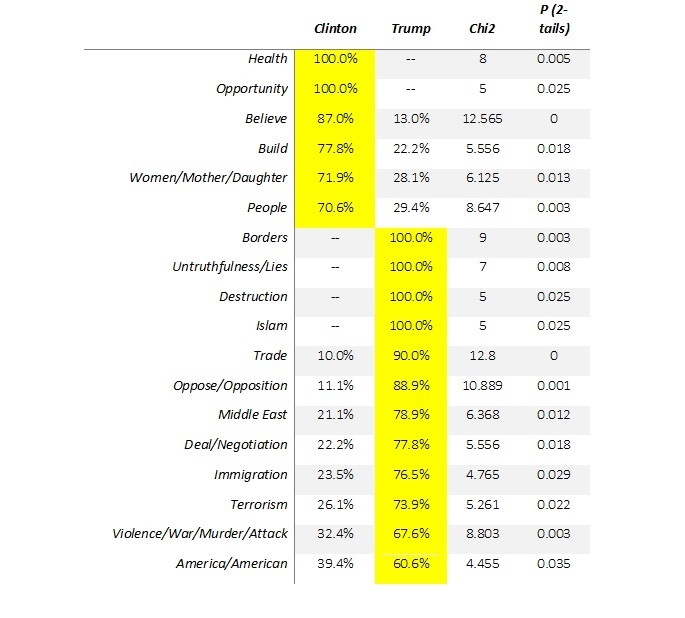 Interestingly, Clinton uses significantly more words and phrases that communicate psychological processes such as insight (reflect on experience) and cognitive processes (express that a topic has been analyzed), which may contribute to positive perceptions by signaling to voters that her ideas are formed through thought and reflection. 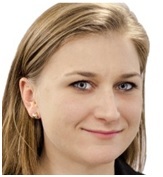 About the Author: Gina Zuercher is an Associate Group Director at Beall Research, Inc., where she oversees both quantitative and qualitative market research studies. Gina has over a decade’s experience in generating consumer insights across a variety of industries, including CPG, consumer durables, retail and grocery. She received her B.A. from Marquette. Beall Research is a strategic market research firm located in Chicago that specializes in qualitative and quantitative research. Beall Research has years of experience applying linguistics and custom text analysis to brands, products, and services. Text analysis is practical because it is a cost- and time-efficient method to measure consumer perceptions contained within unstructured data already available online (i.e., consumer reviews, blogs, social media).